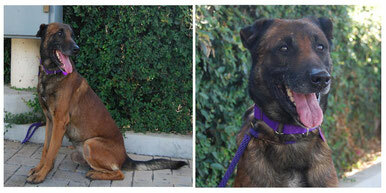 He is 6-7 years old neutered male Belgian Malinois. He is 57-60 lbs. He is microchipped and got UTD shots. We rescued him from local kill shelter because he was surrendered there by his previous owner after they lost the house. According to his surrender note, he lived with small children, good with people and other dogs, had a professional protection training and well mannered. He really is a good dog. He is currently getting some extra training to be okay with cats as well but he is still curious toward to them. He walks as a text book dog on leash and is very sweet to the handler. However, we prefer the experienced dog owner because of his breed. He can be the perfect dog with an experienced handler.